The Benedictine monastery of Ercsi was located about 40 kilometers south of Buda (present—day Budapest), on an island of the Danube next to the much larger Csepel Island. The monastery was founded by Palatine Thomas (1185-1186), who was also buried there. The monastery ceased to exist during the Ottoman conquest of central Hungary and stones of the monastery church were used as building material for the church of Szigetújfalu during the 18th century. 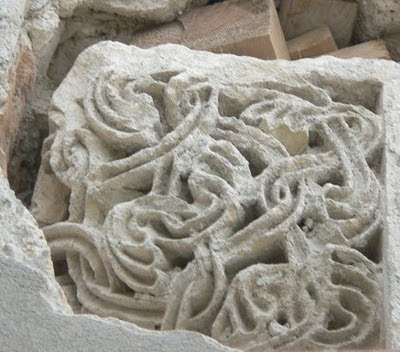 During the past summer, the exterior of the Szigetújfalu was restored, giving a chance to examine the Romanesque carvings used as building material there, and also providing a chance to remove some of these stones. The first report on this was written by Lilla Deklava Farbaky and Balázs Bodó, and was published in the December 2010 issue of the journal Örökség (Heritage), published by the National Office of Cultural Heritage. The issue can be read online (a least by those with some knowledge of Hungarian) – for the benefit of my other readers, I am providing an abstract of the text below. “Topographical literature has noted before that the church of Szigetújfalu was built in 1770 using stones from the abandoned monastery of Ercsi. Géza Entz published this first in an article in 1965. During the Spring and Summer of 2010, while plaster was removed from the exterior of the church, a chance came to finally examine these stones.